The FAX-8360P combines a range of high quality fax and copy functions with efficient innovations in technology to give you a superior communications solution for your corporate office. The FAX-8360P's 33.6kbps Super G3 modem can transmit faxes in as little as 2 secs, improving office efficiency and reducing transmission costs. The machine has 64 levels of gray available for faxing. Add to this the Super Fine function which enables high quality transmission of very small print or line drawings, the FAX-8360P is everything you would expect from Brother. Not only does the FAX-8360P offer superior fax functions for your corporate office environment, it also has a range of useful copying functions that will prove indispensable. 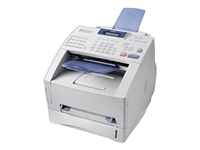 The FAX-8360P offers a copying speed of up to 14 copies per minute. It also enables you to make up to 99 copies of each page loaded into the automatic document feeder. The machine also offers the useful function of being able to compress 2 or 4 pages onto a single sheet and reduce or increase the size of a single document from 50% to 200% in 1% increments.